Return of growth expected in 2010. Unlike the music and print media industries, the TV industry is forging itself a solid position on the Internet, which means that it can be a central player in online video services. The offensive strategy will likely pay off down the line, but will imply value destruction. This destruction will be caused by structural elements: fiercely competitive online advertising market and a lack of control over the circulation of programmes. 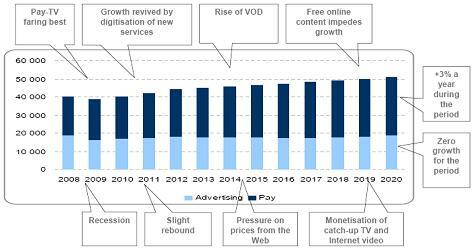 Far from being simply transitory, the economic downturn in 2009-2010 marks the onset of a decade of restructuring for the TV industry, which will begin with an overall decline in the sector’s resources before the proliferation of platforms comes to spur a new period of growth. The decade running from 2010 to 2020 will also be a time of cost cutting, with the industrialisation of TV production that departs once and for all from its historic model, i.e. cinema. The European industry is particularly threatened by the migration to the Web. A review of the regulatory strategy for the audiovisual sector appears both necessary and urgent, and will involve the creation of integrated pan-European conglomerates. · The “My video Web” scenario, which IDATE has chosen as the most likely shape of things to come. It reflects a situation where the current crisis speeds up migration to the Web, the nervous system of social life. It is characterised by ubiquitous roaming, the development of online storage, universal and free connection and a predominance of social networking. · The “Broadcast as usual” scenario emerges from an environment where the recession is protracted, fixed and mobile ultra high-speed network rollouts are few in number and the Internet does not become the central entertainment medium. This is a scenario that remains favourable to media companies to the extent that the Internet’s destruction of value remains limited. · The “Community TV” scenario describes a situation of social instability and State control over the network, combined with user concerns over health risks and protecting their privacy and increased clustering into communities. This scenario is less favourable to the development of a market that will remain fragmented and not terribly solvent.